Every day or two I come home with a pocket full of receipts. 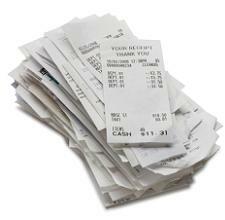 I’m not spending a fortune, though I could be more frugal, but every little thing gets a receipt nowadays. I got to thinking after having to pop to Tesco two days in a row that supermarkets are missing out on a trick here. Why not make it a feature of having a loyalty card that you can opt out of paper receipts? You could have them emailed to you instead or sent to your Tesco club card app. With the aid of smartphones nowadays you’d still be able to check your receipt before you left the store if you wanted and you’d be helping the environment.